Not all goals are suited to each goal setting theory or framework. Here we share a list of the systems that apply for those goals that fit two criteria. Firstly you already have a close idea of what the goal actually is and secondly that you want to ensure you hit your target with a high rate of certainty. Now, don’t get me wrong, simply by applying these systems to your goals does not mean you should have any less effort or seek to top up and nurture your motivation (we go into that later), no, you still need those but with a clear process , these systems help improve your chances to attain what you desire. 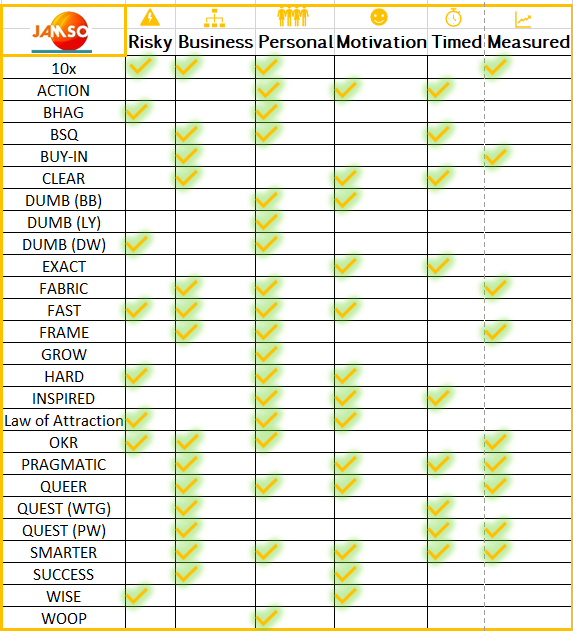 This list forms the second part of a two part article series where we offer a similar oversight of the systems that apply to more vague goals and for the higher risk takers, who do not mind the taste of occasional failure or simply are “all in” on the goal. So, we also provide some positives and weakness points to help you select which system matches your goal phase, experience of success and motivators plus ability to work within specific frameworks. At the very bottom of this significant list we provide a chart summary for all the framework and theories. Created by Tom Terwilliger using Accessible , Concise and Clearly stated , Towards and Timed, Impassioned, Organic, As if Now as a solid and well robust theory. This has many of the familiar elements we see with the most used system SMART but creates a sense of urgency and continual action plus points towards the need to stimulate motivation and and emotional connection to your goals. Positives: Easily adopted and good alternative to SMART. Ideal life change or short term sprint applications that require daily action. Weakness: Does not stretch goals and lacks direct naming of accountability. Business target goal setting is the focus here for Julie Winkel Giulioni’s system. The theory uses Business context, Understanding of required skills to attain the target, Y for a yardstick measurement process for progress. Next the system addresses the need for accurate Information about performance and the Necessary resources and support needed. The theory uses basic management principles and can be a useful guide and template, it is equally easy to apply within personal development but that would then lose the starting B! Positives: Solid and robust simple management template guide. Ideal for those tired of SMART goals. Weakness: Is an executable tool that does not stretch performance potential and time focus. A super theory that is best applied within team or community networks. The Collaborative element strives for a community that can inspire, mentor, support and work together on a common objective. The goal is also defined as specific and Limited in it’s scope. The limited element is a great touch for success as it provides the clarity of time and frame of actions needed per person. The Emotional point is flexible enough to ensure it’s personalisation and covers the motivational elements needed for most goal success. Ensuring some form of Appreciable value with the goal makes progress and success easier to define. The realistic element of Refinable helps the model and participants remain agile to circumstances and still attain a form of success greater or lesser than originally defined. Positives: Super system for organizations, NGO’s and entrepreneurs or business development. Weakness: Designed for teams and networks, not individual personal goals. Lisa Young competes with two others that use the same acronym. The other two systems apply mostly to big goals and taking higher risks. Lisa takes a more pragmatic approach with her Doable, Understandable, Meaningful and Believable approach. Lisa does a good job to balance specificity and motivational elements of goals. Specific note should be made to the point of understandable which helps for shared or delegated goals. Positives: Has a high focus on motivational elements and purpose. Weakness: Circumstances may impact meaning over time so updates are required based on meaning alone. A good next step alternative to tradition SMART goals. The EXciting element helps directly trigger motivation for the goal, making the target Assessable is mostly about resources and capability potential as Challenging allows the model to stretch performance. The concluding point of being Time Framed keeps a priority and progress accountability measure in place. Positives: Applicable to personal development and business goals. Weakness: Retaining “excitement” for long term projects may require alternative motivation tools and systems to be applied. Often overlooked as a system to apply, yet it holds many interesting traits that make it stand out from other theories. Creating clear Focused goals FABRIC and uses Appropriate which can embrace accountability and ethics boundaries. Ensuring goals are Balanced is almost unique in the general context of most systems that are typically more binary in nature. Then ensuring support systems and measures through being Robust is a smart and insightful method to summarize some risk elements. Being Integrated is linked to the balance element but also looks to seek how other external activities can help the goal attainment and be linked to other goals (think KPI’s and Key Results indicators). Finally, recognition to a frequently overlooked Cost Effective consideration is great to see especially within a business context. Weakness: Motivational aspects ignored in the design but could be applied within Robust with careful design. I suspect that few have heard of this theory yet most apply it in day to day activities. Frequently discussed goals makes them top of the mind and provides potential opportunities to gain extra support or measure progress and seek alternative methods of improvement. Making the goal Ambitious certainly address’s the challenge and motivational aspects of goal creation, Specific is identical and used already in other systems so should be familiar to identify and clarify the objective and target scope. Transparent can be addressed in a couple of ways. Firstly being open and public and or transparent within a closed environment such as department, close social group. FAST certainly can be applied across organizations and may add a final framework to similar methods of working. Positives: Formalizes many current natural approaches to goals. Ease of adoption. Weakness: Not time limited or accountability assigned. Created by Woods and Whitehead, the theory has great organizational adoption potential. Few goals allows priority and focus on a managed amount of objectives. Being Realistic, takes from the SMART system to ensure a higher chance of success is secured within the goal design. Agreed is a super important element for collaborative or organizational goals and helps create motivation to attain success. Being Measured ensures progression rates and momentum can be used to help fine tune performances and anticipate time frames. Explicit ensures clarity of the actual goal and it’s criteria for success is considered. Positives: Ideal for collaborative or organizational goals. Weakness: Does not focus on stretched goals. A popular and frequently adopted system in the UK region. Goal is the actual end point you seek to attain, Reality is the existing status, start point or gap to attainment, this insight helps provides insights to the next phase and Obstacles are then listed and Options created to navigate around the challenges in skills, resources etc as identified in obstacles. Finally the natural output is the actual clear next steps as Way Forward which helps steer the next progress actions needed. SPECIAL NOTE: GROW - ROW is an extension of this system. The extra ROW creates a feedback loop and cycle as new realities and prior none identified obstacles are discovered. Positives: Wide applications for a few decades so established as a respectable model. This system was created by the charismatic Mark Murphy. I like the point he ensures motivation is part of the theory through Heart felt, a focus on Animated also helps stretch the goal and seek wider purpose links to the objective goal. Required sets out the criteria and understanding of consequences for not hitting the goal as well as clarifying exactly why the goal is needed - an important step when collaborating with others. Difficult also helps ensure performance is enhanced to maximum potentials. Weakness: Lacks the actual process, this helps define and clarify the reasons of the goal only. JAMSO created this system to compliment other systems that failed to address the daily motivational challenges. We include some gamification elements through random and variable order. The system cover 24 words that act as triggers to emotional connections between the person working the goal and the actual tasks needed on the day. The system also works as a stand alone theory. Individual, Inspiring and Insightful, New, Novel and Now, Sweaty, Social and Specific, Personal, Purposed, Prioritized, Interesting, Impactful and Intentional, Realistic, Relevant and Reachable, Ethical, Enjoyable and Exhilarating, Done daily, Destined and Developmental. Weakness: 24 aspects is a high number so needs to be referable (print outs etc) when making daily connections. Objective Key Results (OKR) has been applied across many leading tech companies. You can certainly also apply the theory to personal improvement goals. A target range of about 60-70% success rate by design helps motivate and stretch your motivation and performance whilst being considerate to the practical world realities of failure with objectives that are challenging. So, this is the most “risky” theory in this specific article list, yet it also appears in my alternative higher risk category. Positives: Increasing acceptance within organizations. Allows for some failure whilst main direction of progress is attained. Weakness: Takes time to develop accurate % of failure at personalized level. Can scare some high performers and steady performers alike. There are several minor variations of this theory and we include them all here. The obvious applications for this system is within organizations but also applies to personal development. Proximate relates to a goal that might be more of milestone or strategy step rather than the true end clear goal point. Relevant/Reliable/Reportable ensure the goal has meaning, is impactful rather than a vanity objective and makes consideration to responsibility and accountability through reports. Achievable, Appropriate and Measurable, Timely/Time bound all borrow from the SMART system, Game-proof is a vital aspect within organizations to control ethical grounds of cheating. Integrated is important within organizations to ensure support and collaboration and resources are allocated across the business to be part of the overall activities. Cost-Effective ensures strong return on investment of time and resources allows to benefit the bottom line and reduce waste potentials. Positives: Great system for organizations and can be linked to other theories that lack system elements. Weakness: Limits scope to tactical levels as opposed to more visionary ambitious goals. John Schneider and David Allen created this simple and effective system. Quantifiable requires the goal to be specific and not vague but also capable of being expressed in a numerical form. The need for the goal to be Understandable is a foundation point and offers clarity for those engaged with the objective. Creating Executable goals means having realistic and actionable steps to follow. Motivation is addressed and the door opens for gamification solutions within the system by making them Exciting. Like many other systems, this also borrows from SMART to apply Relevant goals. Positives: Alternative to SMART, stimulates motivation, applies for personal and organizations. Weakness: Full potential may not be reached due to realistic limitations. No accountability. There are two systems that use the same acronym. WT Gallwey applies Qualities can be used to break down a much larger goal and focus on a key attribute or sub goal that holds the qualities needed and required for full completion. Understanding makes the emotional and motivational connection to the participant. Including the need to define and identify the Expertise required for goal fulfillment, is an important step to help clarify the gap between the start point and needed steps to completion. Having Strategic Thinking allows for better planning and different methods to attain the same aimed success. Timed (same applied in SMART). Positives: WT Gallwey: Good within organizations or part of large personal goals. Weakness: WT Gallwey: The accountability and finance elements are missing. Weakness: P Williams: Personal accountability lacking and motivational aspects missing. The most common known goal setting system of SMART requires and upgrade! Therefore we state here the SMARTER model. We include Ethics, Enjoyable and Reviewed and Rewarding as the missing elements from the original. Addressing the need for Specific goals that are Measured and made Accountable/Attainable are vital for success. Being Realistic/Relevant and Time bound frames the model nicely. The additional elements assures practices and methods recognize and control any tendency to behavior irrationally or unethically just to hit a goal. Motivation is brought into the process through Enjoyable. Being reviewed on a periodic basis and rewarding both compliments the business applications and personal recognition of milestone achievements. Weakness: May not attain full potential but only the required performance of the goal. Use of this model has mostly been applied for collaboration and HR environments. We start with a clear Simple goal, that like many other systems acknowledge the need to be Understandable, I like this also is then considered within a Competence-driven environment and development. The need to recognize goals are to be Communicated clearly is important especially within organizations. Instead of making the goal realistic this pursues the need to be fair through its Equitable design. A wider recognition to have a clear Shared vision with wider impacts and alignment is great to have been clearly identified in this process. Finally we have an open need to design with consideration for Sustained enthusiasm which helps address motivational needs for the duration of the goal. Weakness: No financial considerations stated. This has the coolest name for a goal setting framework! A well researched theory by Professor Gabrielle Oettingen and Peter Gollwitzer. They apply Wish, Outcome, Obstacle, Plan. I have already written an article dedicated to WOOP and our suggestion to make a WOOPER so please read the article via the link above. Positives: Great personal development tool and well researched. Weakness: Did not apply some motivational elements, see our article on how we developed it better.